Mild curry with red lentils and rice • Quick & Tasty - Get Cooking! 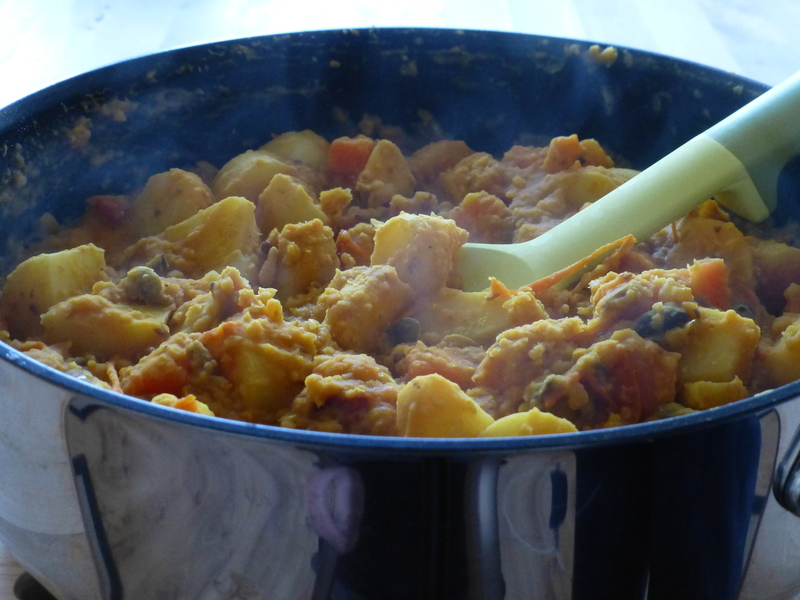 This is a recipe for a delicious mild root vegetable curry. The red lentils give this curry a smooth creamy texture. The tomatoes provide some extra fiber and umami. Slice the tomatoes very thinly. Peel and dice the root vegetables, then either steam or microwave (6 minutes at full power 900 W). Put the lentils and chopped dried tomatoes in a microwave pot with 2 cups water. Cook in the microwave for 2 minutes on full power (900W), then for 10 minutes on 50%. Stir; cook for 5 minutes on 50%. Stir, cook on 50% until there is hardly any liquid left in the pot (typically 5 minutes). Add ginger, spices (except cayenne/nanami) and sunflower seeds, and fry over low heat for a few minutes. Add the tomato slices and fry over medium heat for a few minutes. Add the soy sauce and let it reduce over medium to high heat (this takes just a few seconds). Mix the ground almonds with the lentils and add to the pan, stirring well.